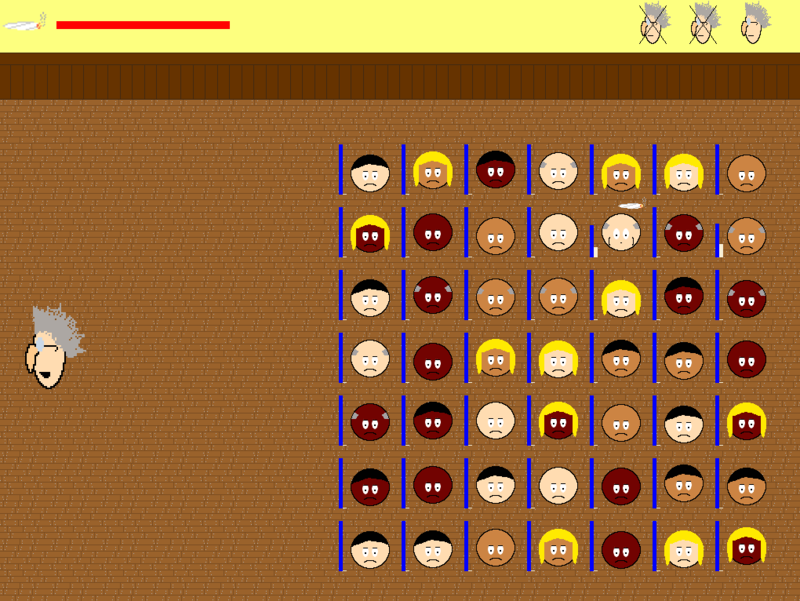 A silly little game coded in about 12 hours for Galway Game Jam 7. Everything, including the graphics were assembled by myself over a single day. The theme was "Charge" which I have taken to refer to energy. So my game focuses on being as lethargic as possible. The premise is simple enough. A group of people stuck in a room having to endure the most boring team training day ever. Rather than pay attention, they've all opted to get high instead. Game play focuses on passing the joint around without the speaker noticing and trying to get everyone as stoned as possible without passing out before the joint wastes away. The speaker is on the left of the screen. When he is facing left you are free to do as you please. However, when he turns to the right, you must ensure that you are not inhaling or exhaling at the time (holding a breath or passing the joint around is ok). 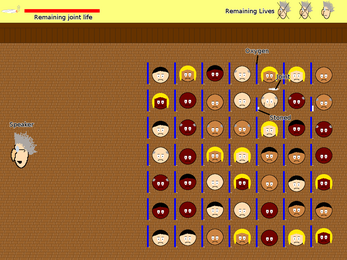 The stoners are laid out in a grid to the right of the screen. To the left of each stoner are two bars. The blue one indicates how much oxygen the stoner has remaining while the pale green bar shows how stoned they are. That, in a nutshell is the game. An abridged version of these instructions can be found under the instruction item in the main menu. The title is taken from Bob Dylan's classic "Rainy Day Women #12 & 35"
The music is by Kevin MacLeod who so very generously makes his music available royalty free on the Internet. This game requires that python 2.7 and PyGame be installed in order to run. It has been developed on a Linux machine and tested briefly on Windows, so it should run fine on either operating system. There's no reason why it shouldn't run on Mac too.